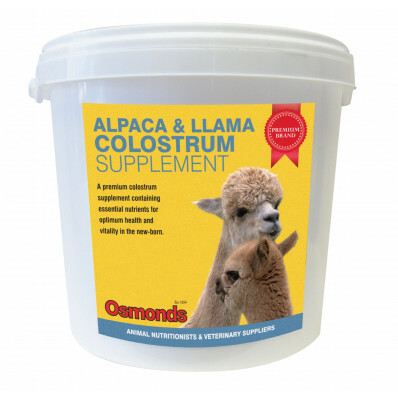 Buy Alpaca & Llama Colostrum From Osmonds. A premium colostrum supplement containing essential nutrients for optimum health and vitality inthe new-born. Contains Pure Dried Colostrum, Dextrose, vitamins and balanced levels of fats and proteins alongside a bio-probiotic for enhancing early digestive functions. Contains Nucleotides "the building blocks of life" to provide even more protection for the new-born. To help boost Colostrum quality simply mix with clean warm (38°C) water in the quantities shown below, shake well and feed, preferably within 5 hours of birth. It is recommended that 60g be fed as soon as possible after birth - this can be fed in 6 x 10g feeds. 6x10g feeds required per new-born. Mix each 10g sachet with approximately 100ml of warm water.